Ever heard the story of the world’s strongest boy? Well, let me pique your interest. His name is Richard Sandrak and at 8 years of age, he looked more like a tiny version of Arnold Schwarzenegger or a circus act than an ordinary 8-year-old. His tale inspired a 2004 documentary ‘The World’s Strongest Boy’ and a host of bodybuilding websites. The documentary detailed his ability to do splits and bench-press three times his own body weight. The strong child began training since the age of two in the United States but the hard work never really paid off. He is now an internet hit after he reappeared in the public eye more than 15 years later in “Where Are They Now”? TV special, looking all grown up, gentle and certainly happier than ever. Join us as we take a chronological look at the story of Little Hercules, his life, and how far he’s come. Richard Sandrak was born in Ukraine on April 15, 1992. His parents Pavel and Lena were sportsmen (Pavel, a martial arts champion, and Lena, an aerobics competitor). The family later moved to the United States in 1994 with the promise of a new life. They lived in Pennsylvania with their two-year-old son but his father wanted more; to make him a weightlifter and a martial artist. Starting out so young, little Sandrak doddered about his father’s home gym. Without considering the weight effect on the child, his father taught him how to lift lighter weights, stretching, and primary martial arts techniques. It was only a matter of time before his workout routine took a turn of its own as a full bodybuilding course including the diet for a bodybuilder. 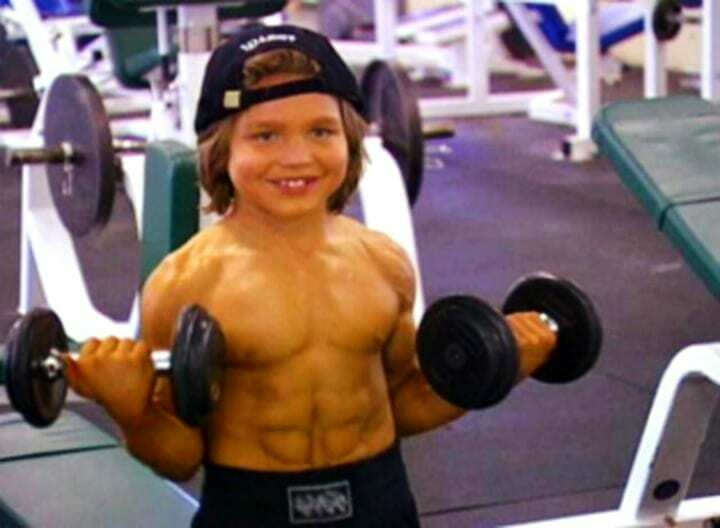 By the time he was four, he was already strong enough to handle 600 push-ups, 600, sit-ups and 300 squats daily (talk about bodybuilding the natural way). That’s sure sounds terrifying! Well, at 6 years, he became fully chiseled out and was bench-pressing weight three times his weight. While living in Southern California with their muscle-bound boy, the family spotted Frank Giardina – a fitness trainer who helped change Sandrak’s fate forever. During Giardina’s first encounter with the young builder who looked like a tiny version of Schwarzenegger, he thought he was a midget. With time, the combination of his father’s strict fitness regimen and Giardinas’ new regimen, Sandrak grew into a stronger boy, maintained on a good bodybuilding diet. By age 8, Richardard Sandrak was able to bench-press 210 pounds. It was good news to his family and they took another bold venture unveiling the bodybuilder to the world. Richard Sandrak gained international fame for his athletic build in the 2004 documentary “The World’s Strongest Boy”. This was when he graced a bodybuilding event as Little Hercules. He was suitably named the world’s strongest child. Richard’s parents’ long dream came alive when he began to land countless contracts. He also received endorsements for television appearances and invitations for bodybuilding nutrition videos. Hundreds queued up to meet him in person and financial rewards streamed in. His physique also made the front page news of many magazines. He began travelling across the country to take part in competitions, and photo shoots for numerous magazines as a body builder. Nevertheless, his father gathered as many criticisms for pushing small Hercules a bit too much for the fame. Given the obvious progress, little Hercules was subjected to a non-stop workout routine. His money thirsty father forced him to undergo his bodybuilding strength training miles away from the classroom and so found it a bit difficult to play and mingle with friends. As the strength training progressed, Giardina began to notice Pavel’s brutish and uncivil character. He forced Richard to spend the night on floors to enhance his body. Made him repeat exercises when he fails an attempt. Sandrak was never able to eat junk food or any sweets. His father placed him on a harsh diet for a bodybuilder even when he enjoys comfort foods like pizza in front of him. It was really challenging — physically and mentally, although Richard says his father never forced him into bodybuilding. When Giardina could no longer stand the abuse, he tried to stop Pavel. But Pavel threatened to kill him, forcing him to leave the family. The world kept celebrating the young man without knowledge of his tough predicament. Behind the buff body frame and popularity lied sadness in the heart of a boy who had no childhood outside the gym. At 15, his fame was already sinking. Yet, his father made him headline-grabbing once more. Giardina’s concerns had pushed the family in a rough spot as Pavel turned against Lena. He let off his frustrations on her, abusing her to the core. Richard had to call the police and requested for no-siren rescue to escape his father’s wrath. The assault left Lena with a broken nose and wrist, Pavel was thrown into prison and under psychiatric supervision. With his father basking in jail, Hercules enjoyed a better life. He got back with his trainer, Giardina while his mother filed a divorce suit. As the divorce case went on, Lena employed a new talent manager, Marco Garcia. Even so, Richard had a normal life and munched on just about any junk food. Hercules, nonetheless, pursued his father’s initial dream to venture into show business again. In 2009, his new talent manager, Garcia released his debut film titled “Little Hercules” in 3-D featuring Sandrak, Hulk Hogan and Judd Nelson. In 2012, Hercules starred in two more movies but new career tossed and turned. Be that as it may, he went on with his bodybuilding workout, but narrowed it to fives times a week and 90 minutes of training every day. He later landed an endorsement to star in health shows for kids named “Workout Video for Kids”. Sandrak has now reached the posh age of 24 and he’s transformed quite a lot. He now looks different from the little Hercules who flew up the sky. He’s given up on weight-lifting and is now almost unrecognisable which is by any rate, good. He now has a beard, ponytail and a built stomach that hides his once defined six-pack abs. Richard Sandrak told Inside Edition that he and his mother cut ties with his dad after he was jailed and so he did the same to bodybuilding. Good enough, the Hercules we used to know found a new dream along the line; to be a quantum scientist or an engineer for NASA. He now works as a stuntman at the Universal Studios Hollywood Waterworld show but says he no longer wants to be a bodybuilder. For Sandrak, “I don’t like weights anymore. If anything, it just got boring to me”. Richard may have dumped weightlifting and the strict diet for a bodybuilder for life but he didn’t let himself bulge out. As a child, Richard was once rumoured to had been given steroids by his mentally deranged father. This was after the 2004 documentary ‘The World’s Strongest Boy’ claims his body fat was less than 1 percent. And since this can be harmfully low, medical experts’ hypothetical supposition argued that such muscular development needs testosterone which children younger than 10 do not have –suggesting steroids were involved however, Lena Sandrak, Richard’s mother denied that her son used such substances. Well, having given up on fame and all the gossips that come with it, Richard is now adopting a healthier attitude toward his past and embracing his future. He is excited and enjoys the privacy that comes with not being famous. Richard is currently single and has never been married yet. His sexual orientation is straight. He presently lives a simple life in Los Angeles. His zodiac sign is Aries. He is not very rich and has dumped the dark days behind him.